By any other manufacturer's standards it might be considered a reasonable, if not exciting bike. By Honda's it is less than a worldbeater. ONCE upon a time Honda used to make very good vertical twins, Starting with the (CB72 and passing through the delightful little l25SS. CB250 and CB350, they all had their own characters and, frequently, were the top of their class. 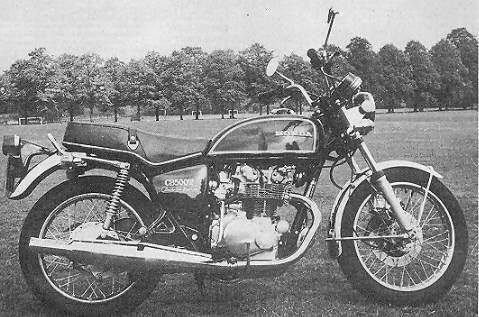 Perhaps less successful but considered by many to be underrated was the CB450, the "Black Bomber'', Which brings us to the CB5OOT . 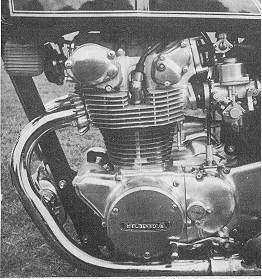 The logical successor to the 450, it somehow turns out to be nothing of the sort and, if its ancestry is to be considered, then the current CB360 would seem to be its close brother.In fairness, we do not really think that it has any present-day antecedents for it appeared on the American market at about the same time as the (CB260 and the rest of the range associated with it. We're waffling really, waffling to avoid plunging into the nasty business of saying that in our experience the CB500 is one of the least attractive motorcycles to come out of the Honda stable. One of the ironies is that it looks so right. The finish is dark brown with matching seat-a colour that sounds awful yet looks great. The motor is just rugged enough to give It character, a decent-size engine that looks like a 500. It was, of course, completely oil tight and retained its pristine new gleam. Keeping it that way is going to take reasonable effort but will be worth the trouble. Obvious point of comparison with the CB500 is the old CB450 and, indeed, if it helps to trace the heritage of the CB500 at least it shares a 70mm bore ! The stroke is increased to 64.8 from 57.8 to give the extra 54cc.Weight has gone up by a mere 6 kg to ! 93 kg (387 lh), which is reasonable by today's standards, The looks, have of course, changed with the times and the old "Bomber'' tank with the pointed front has given way to one that is more European than the Europeans. The motor remains the same relatively simple double overhead camshaft vertical twin with no "artifical aids'' to eliminate vibration, . with the result that, not surprisingly , it vibrates ! Mildly below 40 affecting the mirrors, more between 40 and 60, with the speedometer suffering the shakes, enough to be felt through the grips below 70 and considerably, by Honda's standards, above 70. Below 60 It was merely irritating in its affect on mirrors and instruments, above this speed it was tiring after a while. Perhaps time has dimmed our memory a littie but we do not recall the 450 being like this; in fact the later version of the450 was notable for its smoothness. But it was not the vibration that troubled me but the transmission backlash. A common enough Honda occurrence but more noticeable on the 500. Perhaps it is because the motor is less flexible than others in the range, not being at all happy at low rpm. This is very much a machine that has to be revved and. to its credit, it was more than willing to do that. Response to the throttle was immediate, the tachometer needle shooting backwards and forwards as though it were directly connected to the twist grip. It was difficult to decide whether this was a virtue or vice for so delicate was the control that it needed above average concentration to maintain, say, smooth progress in traffic. On the other hand the bike had a very quick reaction when it was needed. Engine and exhaust noise were very low, the exhaust particularly so and it was easy to take the odd liberty without giving offense. The transmission : five-speed, an easy-to- find neutral and silent operation of all gears, including bottom. A good gearbox to use but, as mentioned earlier it did have this backlash ! It showed itself particularly in 2nd gear when, say, we were just a little lazy going around a slow corner. If we failed to engage bottom, the transmission objected noisily, whirring and clanking as though the gears had lost the odd tooth or two. This applied in all gears, excepting bottom, but got worse the lower the gear. All these criticisms, Isn't there any good in the bike? Yes, More than we expected, really, considering our initial incompatibility with the bike. The handling for a start, was good. The single-down-tube cradle frame loops back up to about the centre of the dual- seat. A pressed steel welded sub-frame serves to locale the pillion footrests and silencer mountings. Suspension is conventional telescopic front fork and adjustable swinging arm rear, with the difference of being somewhat firmer than usual on Japanese machines. The result is a machine that handles very well indeed with no wallowing, and with precision-but with a slight loss in immediate comfort. In our experience softly sprung bikes often become uncomfortable after a time. Not so the CB500. The brakes, single disc front and drum rear, were superb and in this they had the unexpected bonus (non-standard) of British Dunlop TTl00s, 3-25 x 19in front and 4.10 x l8in rear. Japanese Dunlop tyres are good but these were even better. The electrics, too, earned high marks. The headlight was up to Honda's usual standard, the horn was way above it, being unusually strident. The stop light worked, as is common nowadays, off the front and rear brake and the flashing indicators reflected the growing trend to use lights that were adequate by day or night. Finally, there is the electric starter that spun the motor easily and always started the Honda at the merest caress of the button. Provided, of course, one had set the cold-start lever first when the motor was cold . . . and remembered to switch the engine stop button on ! Magnitficent-looking eng ine ! Not the most impressive of the Honda range in sheer bulk, but surely the best looking in an engineering sense, double overhead camshaft and all . . . The controls were just about as good as we would have wished, with Honda at last moving the ignition key to the centre of the steering head where it can be easily reached. The left lever housing contained the horn/pass light, dipswitch, which was in the inside position- perhaps the only point of criticism for we would have preferred the dipswitch to be nearest the thumb, a position reserved for the direction indicators. We imagine that it is impossible to satisfy everyone with the position of controls and we don't really feel strongly about it. On the right side was starter button, lights on and off and of/on/off switch on the top. When will they learn to isolate the starters well as the coil with this switch ? It is such a civilized way of letting the rider know that he is switched off, far better than flattening the battery ! When it comes to looks, as we have said the 500 rates with the best, Which is of course, purely a personal view. Others might think differently. The addition of above average amount of chrome, on the headlamp brackets, rear carrier, fork stanchions, speedometer base and mudguards has not cheapened the looks of the bike and it complements the brown finish well. Extras include the standard helmet and steering lock, twin mirrors, toolbox under the seat (which was empty !) and a very neat compartment set into the seat for documents and handbook, One "extra'' that we would have liked to see is a generator warning light. Modern bikes throw a great weight on their electrics and it would be nice to know if they were not still working. Come to think of it, we've never had generator failure on a Japanese bike so perhaps their confidence is not misplaced. The Honda was unusually quiet, its exhaust note giving the bike a flatness that implied that it was not going very quickly. In fairness, for a 500 it was not unduly quick, its just over 90 m.p.h, top speed being about par for its class, a little below if you include the hotter two-strokes. It was really at its best in the 40 to 80 m.p.h range which is after all the area where most riders will be needing it. It responded almost like a two-stroke in this speed, the tachometer needle flying around the dials but, as we have said, the revs needed to be kept up if the motor was to give its best, Above 5000 for decent performance, a bit less if more sedate motorcycling was acceptable. Fuel consumption for the test averaged 53 m.p.g, Is that good ? It depends what one is used to, we suppose. It is thirstier than the Honda 750 but more economical than a hot two-stroke three. It seems to us that 53 isn't really brilliant for a 500 but we have almost come to accept it as fair. Of the Hondas that we have tried over the past few years the CB500T perhaps shares with the CB360 the spot as the one that appeals to us least. It is no coincidence that both are in the same mould, having all their performance at the top end, a fair degree of transmission back- lash and more vibration than we wished. On the credit side they looked and sounded good, were reliable and were simple to work on which certainly puts them one up on the fours. Many will find and our complaints niggling and, indeed, we know many riders who own the CB500T and think it is a terrific bike. We'd sooner have the cheaper CB400F. The CB500T sells at f 729. Copyright Bruce-Mainsmith "The world of Motorcycles"